Ask any vegetarian and they will typically tell you that one of the things they find hardest as a vegetarian is not actually avoiding meat and fish. It is knowing which products are vegetarian, and which are not. It can be a tricky minefield to navigate as there are all sorts of products which you might think would be vegetarian, but are surprisingly not. Cheese is a typical example of such a product as some cheese is vegetarian but not all cheese is. Some vegetarians can easily get a little stuck in a rut as they may stick with a cheddar which they know is vegetarian, even if it does not have the most delicious flavour, rather than going through the hassle of trying other brands. 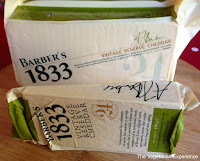 Enter Barbers Vintage Reserve Cheddar - a completely vegetarian and extremely tasty and delicious Vintage Cheddar Cheese! Based in Dicheat Somerset since 1833, the sixth generation of the Barber family are now creating cheese which Vegetarians can feel completely guilt-free and comfortable about enjoying. Barbers Vintage Reserve Cheddar doesn’t contain any animal rennet or animal products and so it is completely 100% vegetarian! Using traditional “cheddaring” techniques, it takes up to two years to create this fantastic West Country 24 month matured Farmhouse Cheddar, and the proof of the quality of the cheddar is definitely in the tasting, as this cheese is full of flavour, taste and depth. 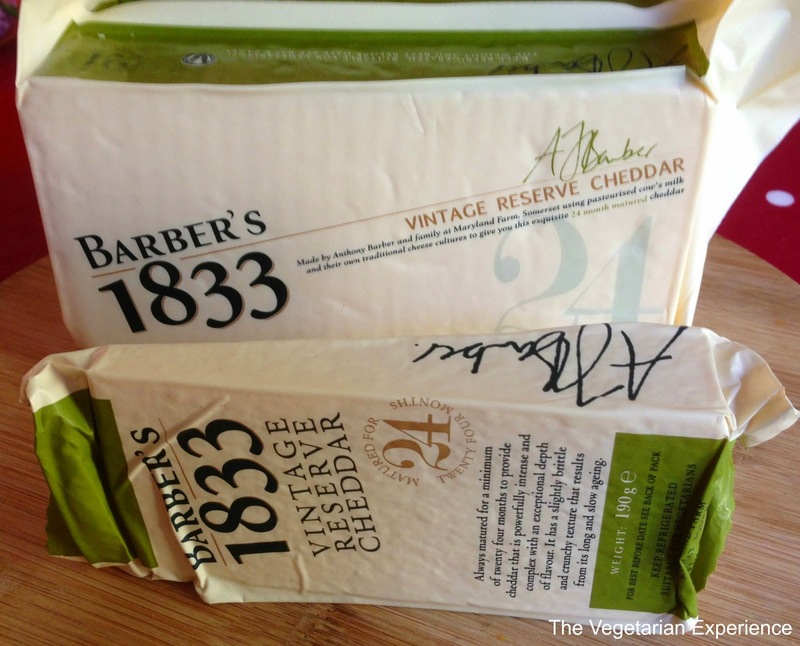 I regularly buy Barbers Cheddar as I trust the brand to be vegetarian, and I also love the taste of the product. The cheddar has a distinct mature flavour, which is also very smooth and mellow at the same time and is well suited to use in a grilled cheese sandwich, alongside a nice glass of wine, or in a more creative dish! Barbers asked me to create a recipe using their vintage reserve cheddar which would demonstrate the versatility of the product, and not compromise on taste. I decided to create a Cheddar and Leek Crumble as the simple ingredients do not mask the flavour of the cheese, and so the rich taste of the cheddar really comes through. 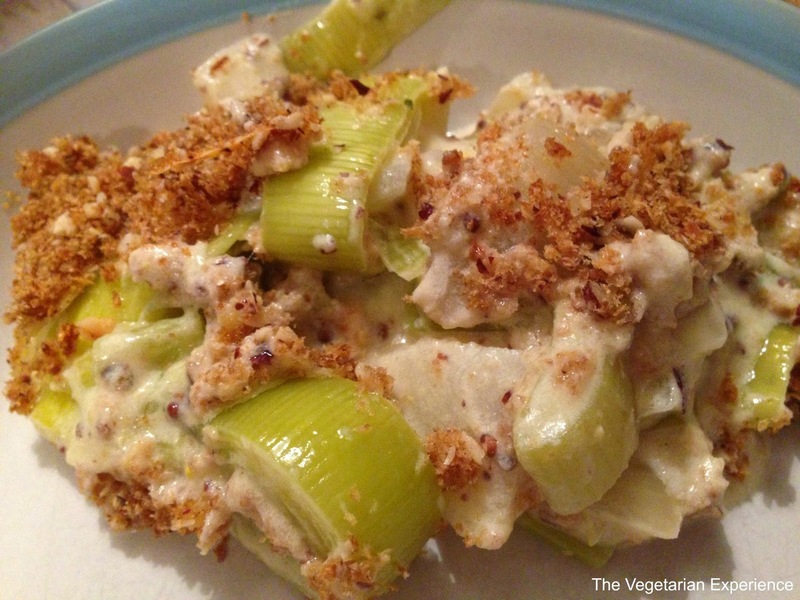 The recipe is really easy to make and could even be made and left to cook in the slow cooker! I think that Cheddar and Leek Crumble is a great dish to serve all year around. This dish would make a great main course in the Spring and Summer, and would also be a great side dish to a slightly more hearty meal in the Autumn and Winter. Barbers Vintage Reserve Cheddar is available to buy online, from the deli counters in good farm shops, and Sainsbury's, Waitrose & Morrison's stores. I would recommend getting yourself some Barbers Cheddar and trying out this recipe as you will not be disappointed! I would love to hear what you think of this dish, so feel free to leave me a comment below with a review when you have made it! Preheat oven to 200°C. Melt the butter over a low heat and swish around the pan to distribute evenly. Add the onion and leeks and cook for around 5 minutes until the onion is transparent. Add the cream, vegetable stock and mustard, and cook for around 15 minutes, or until the leeks start to soften. Remove the pan from the heat and stir in 250g of the Barbers cheddar cheese, allowing it to melt into the mixture. Transfer the leeks and pan juices into a ceramic oven-proof dish. The pan juices should be just covering the leeks, but not saturating them, so you may need to remove some of the pan juice from the dish. In a blender, whizz the nuts and breadcrumbs together until finely chopped. Take 125g of the Barbers Cheddar and stir through the mixture. Sprinkle the other 125g of the cheddar over the top of the leek and pan juices. 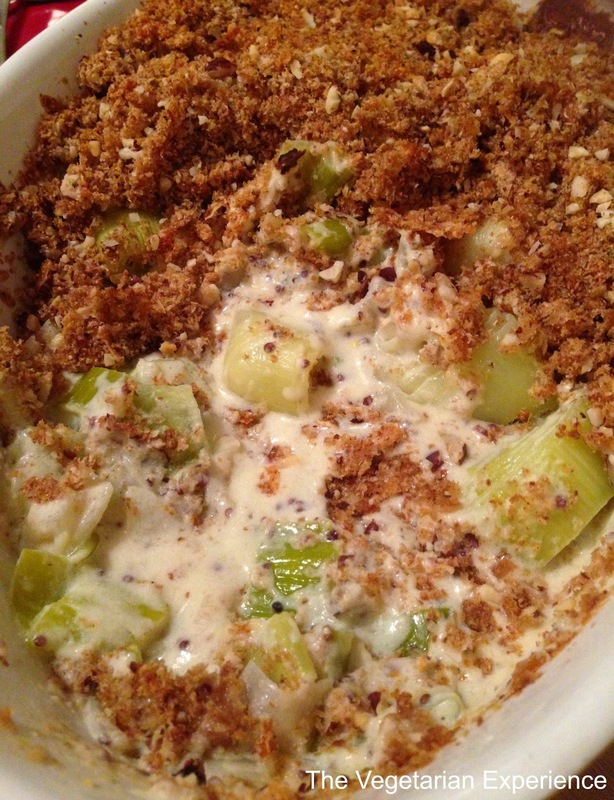 Sprinkle the breadcrumb mixture over the leeks and cheese. Spread evenly to cover.